feathered up against me in a dream. We have a Saturday morning family ritual. We wake up early, the kids tumbling into our bed for cuddles and giggles, burrowing deep under the blankets to ward off the Melbourne-morning chill. Usually around the time one of us receives an accidental knee to the groin, or elbow in the eye, we get up, throw our clothes on, and head over to Victoria Market for our weekly shopping. I grew up weaving in and out of the Vic Market stalls. My parents, my uncle and my grandparents sold jeans at the market for most of my childhood. Some weekends we would come down to visit while they worked – my memories are of my parents’ mustard-yellow van piled high with neatly folded stacks of pants, the leather and soft suede jackets at the stall next door, running down the aisles of the market with my brothers to visit our grandfather or uncle on the other side of the market, the impossibly high roof of the shed, our shouts echoing up and up and up. These days, we start off in the deli section, buying fresh bread and treats, spicy potatoes borekas, gozleme, and black coffee for brekky. Watching the kids scoot about, eyes wide at the candy store, choosing a slice of cake for later, running back and forth between S and I as we shop, carefully carrying their paper-bagged treats, reminds me of how these everyday spaces can still be magical for kids. Places of endless discovery. It brings the delight back in it for me, too. Once we’ve had our breakfast (and done the Saturday Paper quiz, of course) S and the kids head over to buy meat while I get the fruit and veg. Long ruby stalks of rhubarb, bunches of fragrant herbs, tender pale-green asparagus, rows of sunset carrots. A few weeks ago, the stalls were all piled high with creamy cauliflower the size of basketballs, nestled in their feathery-green leaf nests. I bought two. 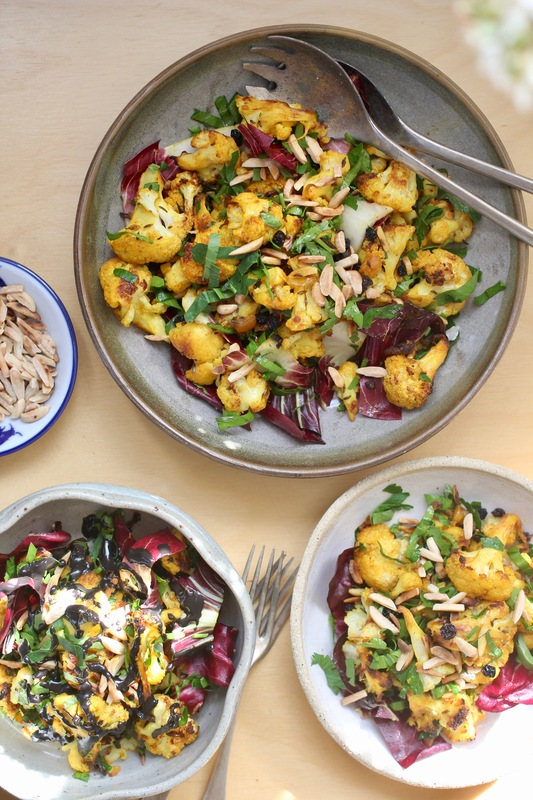 Every week since then, I’ve been making this Roasted-Turmeric Cauliflower Salad. 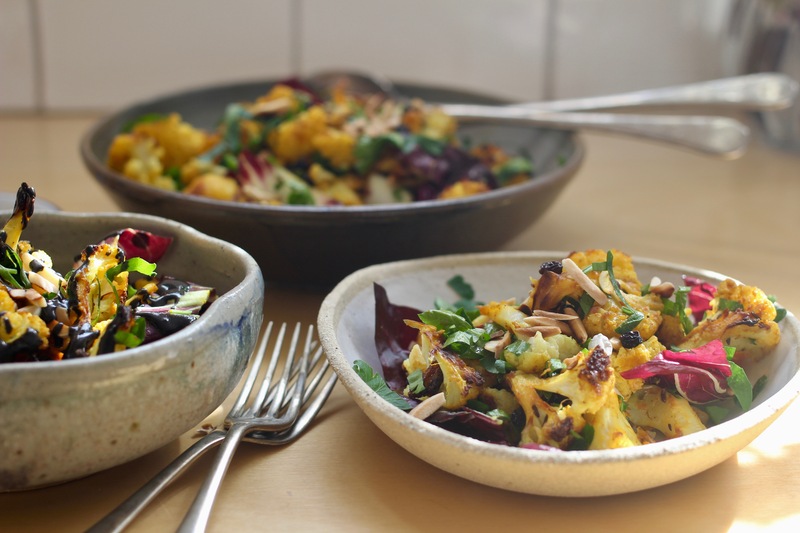 The trick is to roast the cauliflower deeply, ’til the florets turn brown along the edges, almost blackened. 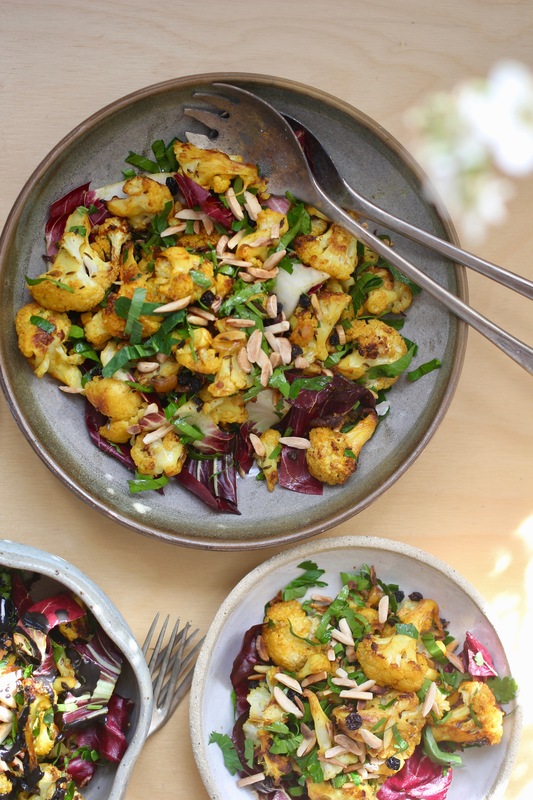 The earthy-turmeric flavours of the cauliflower are then tossed through with the vibrancy of preserved lemon and fresh parsley, the bright bitter radicchio, almond crunch and a hint of sweet from the currents. It is my perfect late-winter lunch. This salad is best served warm or at room temperature. It will keep, covered, in the fridge for a few days, but is best taken out an hour or so before eating. 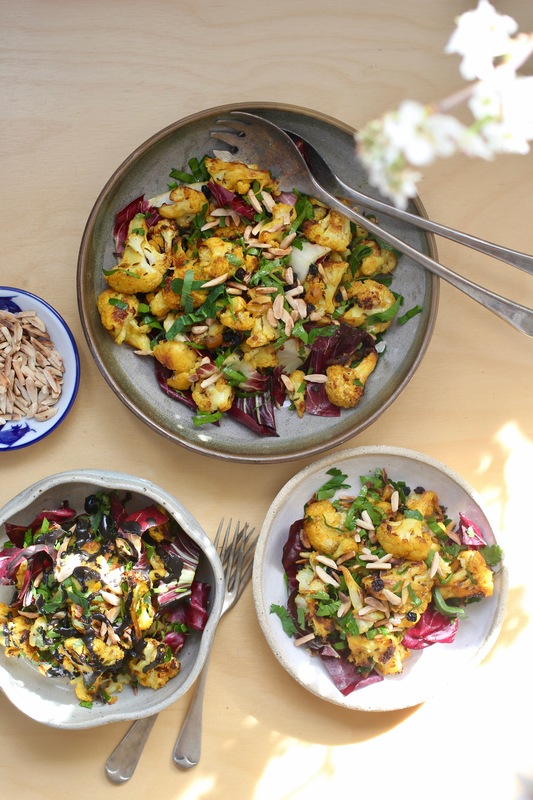 I always serve the tahini drizzle on the side so that people can have as much – or as little – as they like (I made my tahini drizzle out of black-sesame tahini, hence its colouring in the photos!). You can throw some dutch carrots in with the cauliflower if you’ve got some lying around, and a yoghurt sauce (like this or this) can be a lovely replacement to tahini drizzle as a dressing. Cut the cauliflower into small-ish florets. 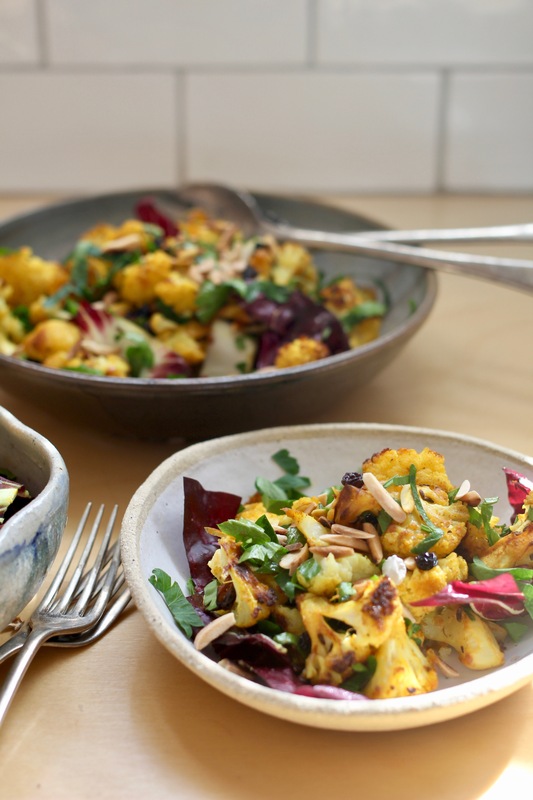 In a deep baking dish toss the florets through with the olive oil, the turmeric, the paprika, the coriander and the caraway seeds. 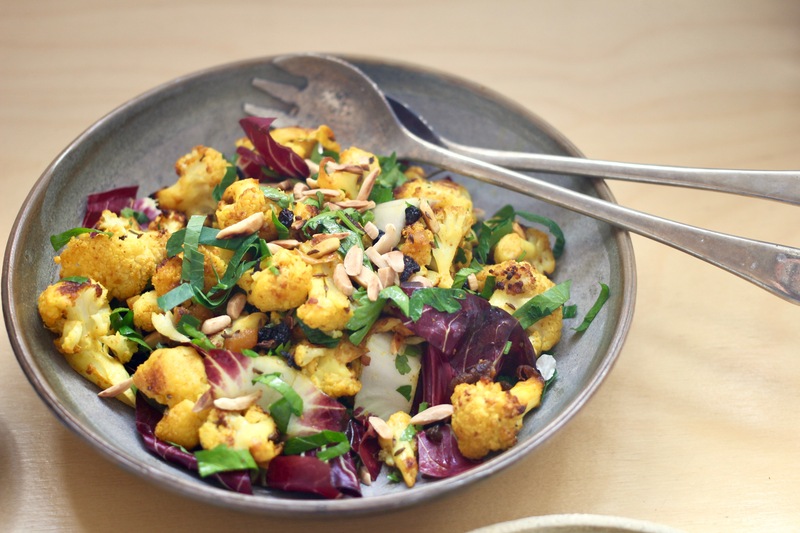 Using a sharp knife, finely chop the preserved lemon and toss it through with the rest of the cauliflower. 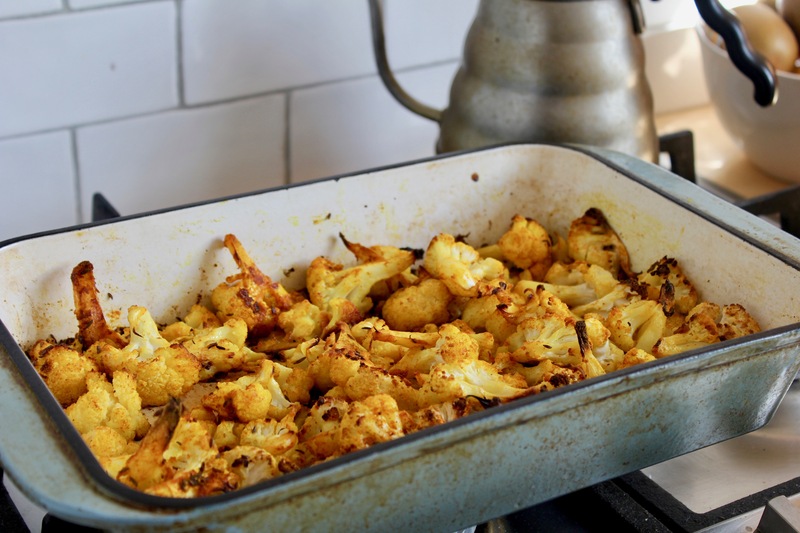 Bake in the preheated oven for 35 minutes, or until the cauliflower is deeply browned. 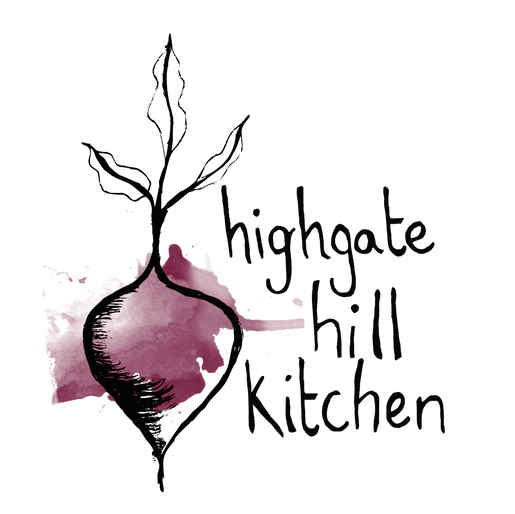 While the cauliflower is baking, wash and roughly chop the radicchio leaves and the parsley. Add to a large salad bowl, along with the currants and the slivered almonds. Prepare the tahini drizzle (whisk together two tablespoons tahini, the juice of one lemon, a drizzle of ice water and salt and pepper, to taste). 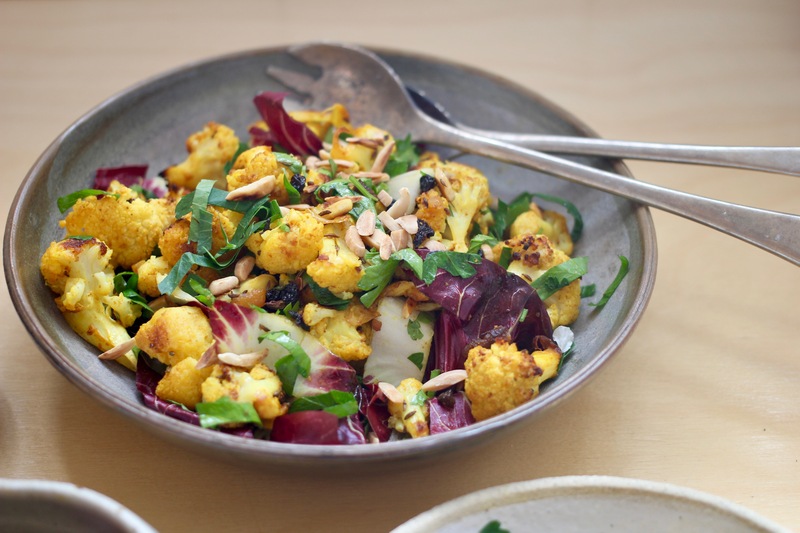 Add the turmeric-roasted cauliflower to the large salad bowl and toss to combine. Serve immediately while warm (or at room temperature), with the tahini drizzle on the side.